Whitwell, Tennessee might seem like an unlikely spot for a Holocaust memorial. There are few, if any, Jews in the rural two-stoplight town on the edge of Appalachia, which lies just a few miles down the road from both the birthplace of the Ku Klux Klan and the site of the Scopes Monkey Trial. But that inauspicious heritage didn't stop the students and administrators of Whitwell Middle School from mounting an ambitious tribute to the victims of Nazi genocide. They set out to collect 6 million paper clips -- one for each Jew killed in the Holocaust. This poignant documentary chronicles the school's efforts, which succeeded so spectacularly that the project soon expanded to include a unique memorial -- and made sleepy Whitwell a center of national attention. Ergo is proud and honored to have served as Executive Producers for this important movie, a 2005 Christopher Award winner and a 2006 Emmy Nominee for "Best Historical Programming - Long Form". In addition, the film garnered awards from the Palm Springs International Film Festival, FilmFest DC, World Cinema Naples Film Festival, Jackson Hole Film Festival, Rome International Film Festival, and the Washington and Detroit Jewish Film Festivals, and was a featured selection at the Tribeca, Sarasota, Nashville, Santa Fe and Seattle Film Festivals. 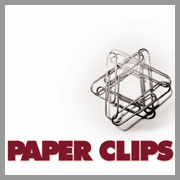 Following its release throughout the US and an extended run on the HBO family of networks, Paper Clips is now available on DVD from Hart Sharp Video.